, an eminent engraver and antiquary, was born in the parish of St. Martin’s-in-the-fields, London, in 1684. His parents, he says himself, were more honest than opulent; but, according to his biographer, “if vanity had entered into his composition, he might have boasted the antiquity of his race: two of his name were employed by Henry VIII. in the board of works.” He might have added, that in Ashmole’s “History of the Order of the Garter,” p. 136, a William Vertue is mentioned, as free-mason, 21 Henry VII. and one of the architects of the royal chapel of St. George, at Windsor. 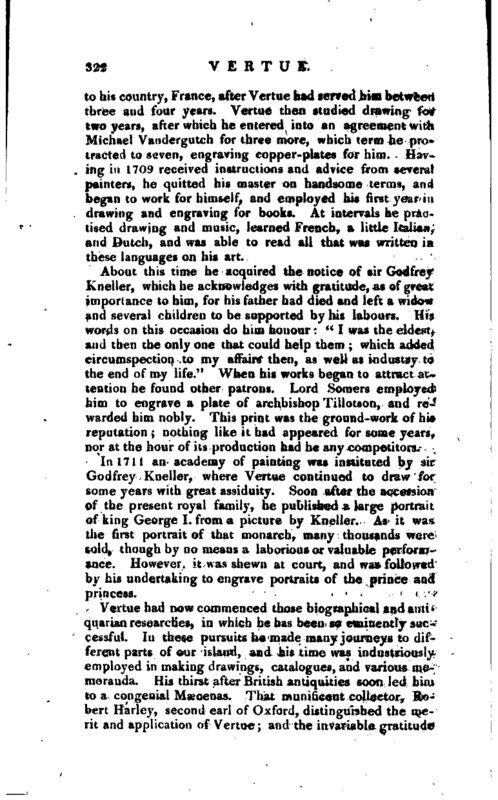 About the age of thirteen Vertue was placed with a master who engraved arms on plate, and had the chief business of London; but who, being extravagant, broke, and returned | to his country, France, after Vertue bad served him between three and four years. Vertue then studied drawing for two years, after which he entered into an agreement with Michael Vandergutch for three more, which term he protracted to seven, engraving copper-plates for him. Having in 1709 received instructions and advice from several painters, he quitted his master on handsome terms, and began to work for himself, and employed his first year in drawing and engraving for books. At intervals he practised drawing and music, learned French, a little Italian, and Dutch, and was able to read all that was written in these languages on his art. About this time he acquired the notice of sir Godfrey Kneller, which he acknowledges with gratitude, as of great importance to him, for his father had died and left a widow and several children to be supported by his labours. His words on this occasion do him honour: “I was the eldest, and then the only one that could help them; which added circumspection to my affairs then, as well as industry to the end of my life.” When his works began to attract attention he found other patrons. Lord Somers employed him to engrave a plate of archbishop Tillotson, and rewarded him nobly. This print was the ground-work of his reputation; nothing like it had appeared for some years, nor at the hour of its production had he any competitors. In 1711 an academy of painting was instituted by sir Godfrey Kneller, where Vertue continued to draw for some years with great assiduity. Soon after the accession of the present royal family, he published a large portrait of king George I. from a picture by Kneller. As it was the first portrait of that monarch, many thousands were sold, though by no means a laborious or valuable performance. However it was shewn at court, and was followed by his undertaking to engrave portraits of the prince and princess. 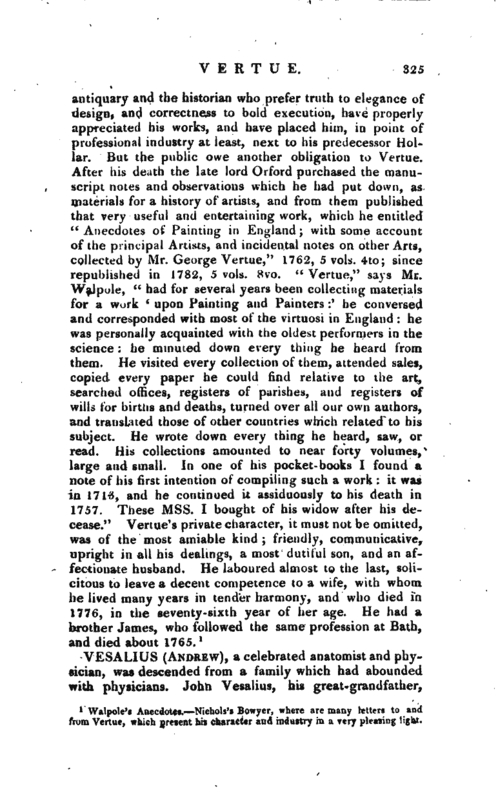 Vertue had now commenced those biographical and antiquarian researches, in which he has been so eminently successful. In these pursuits he made many journeys to different parts of our island, and his time was industriously employed in making drawings, catalogues, and various memoranda. His thirst after British antiquities soon led him to a congenial Maecenas. That munificent collector, Robert Harley, second earl of Oxford, distinguished the merit and application of Verttte; and the invariable gratitude | of the latter, expressed on all occasions, attests at once the bounty. of his patron and his own humility. Another of his patrons was Heneage Finch, earl of Winchelsea, whose portrait he painted and engraved, and who, being president of the society of antiquaries on its revival in 1717, appointed Venue, who was a member, engraver to that learned body. Henry Hare, the last lord Coleraine, was also one of iiis antiquarian benefactors, and the university of Oxford employed him for many years to engrave the head pieces for their almanacks. With lord Orford, lord Coleraine, and Mr. Stephens the historiographer, he made several tours to various parts of England. For the former he engraved portraits of Matthew Prior, sir Hugh Middleton, and other distinguished men: for the duke of Montague he engraved sir Ralph Windwood; for sir Paul Methuen, the portraits of Cortez, and archbishop Warham from Holbein’s original at Lambeth; and for lord Burlington, Zncchero’s queen Mary of Scotland, a plate which evinces more felicity, and a better taste of execution, than most other of his works. In 1727 he travelled with lord Oxford to Burleigh, Lincoln, Weibeck, Chatsworth, and York, at which latter place he obtained from Francis Place many of those anecdotes of Hollar which are inserted in his biography. In the next year, the duke of Dorset invited him to Knowle. From the gallery there, he copied the portraits of several of the poets, but he was disappointed on an excursion to Penshurst, at not finding there any portrait of sir Philip Sidney. 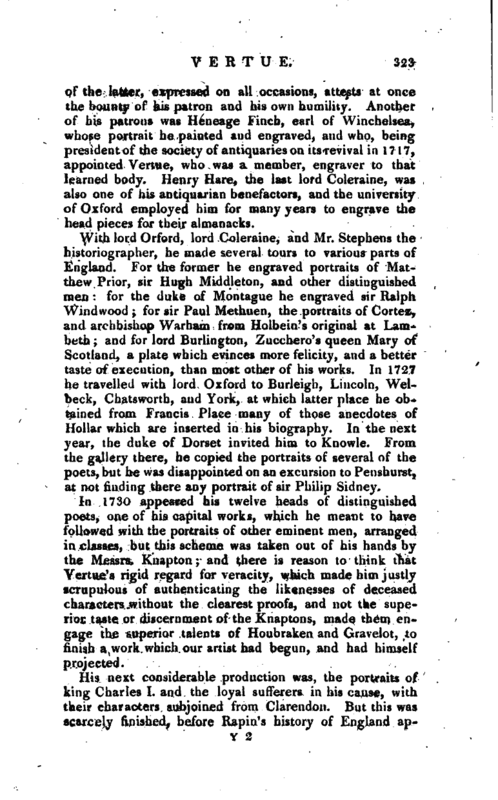 In 1730 appeared his twelve heads of distinguished poets, one of his capital works, which he meant to have followed with the portraits of other eminent men, arranged in classes, but this scheme was taken out of his hands by the Messrs. Knapton; and there is reason to think that Vertue’s rigid regard for veracity, which made him justly scrupulous of authenticating the likenesses of deceased characters without the clearest proofs, and not the superior taste or discernment of the Knaptons, made them engage the superior talents of Houbraken and Gravelot, to finish a work which our artist had begun, and had himself projected. His next considerable production was, the portraits of king Charles I. and the loyal sufferers in his cause, with their characters subjoined from Clarendon. 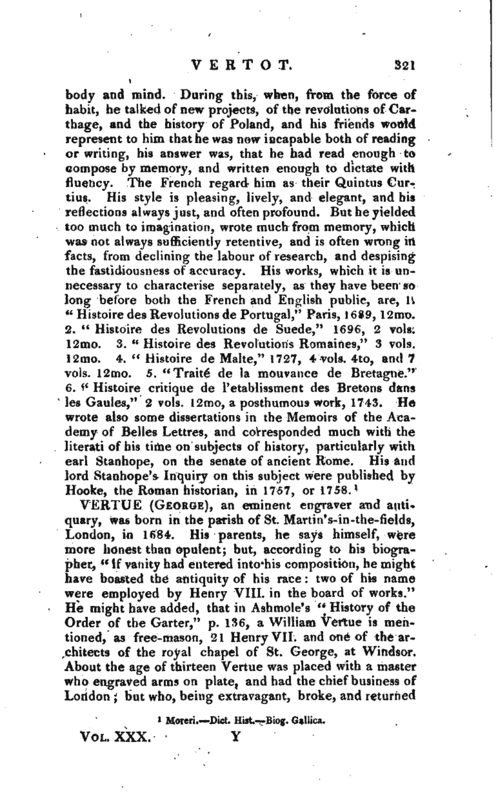 But this was scarcely finished, before Rapiu’s history of England | appeared; a work which bad a prodigious run, insomuch that it became all the conversation of the town and country, and the noise being heightened hy opposition and party, it was, proposed to publish it in folio by numbers, of which thousands were sold every week. The Messrs. Knapton engaged Vertue to accompany it with effigies of the kings and other suitable embellishments, an undertaking which occupied three years of his life. He presented a copy of this work, when finished, richly bound, to the prince of Wales, at Kensington. He now renewed his topographical journeys, accompanied sometimes by the earl of Leicester, sometimes by lord Oxford, and sometimes by Roger Gale the antiquary; and between 1734—38, visited St Albans, Northampton, Oxford, Penshurst, Warwick, Coventry, Stratford, and travelled through the counties of Kent, Sussex, and Hampshire, where he made various sketches, drawings, and notes, always presenting a duplicate of his observations to his patron lord Oxford. In 1739 he travelled eastward with lord Coleraine, through the counties of Essex, Suffolk, and Norfolk, stopping as usual to make drawings and observations at every memorable church, seat, or other spot congenial to his pursuits. In 1741 he lost his noble friend and patron the earl of Oxford, who died on the loth of June. But his merit and modesty still raised him benefactors. The countess dowager of Oxford, even, alleviated his loss, and the duchess of Portland (their daughter), the duke of Richmond, and lord Burlington, did not forget him among the artists whom they patronized. 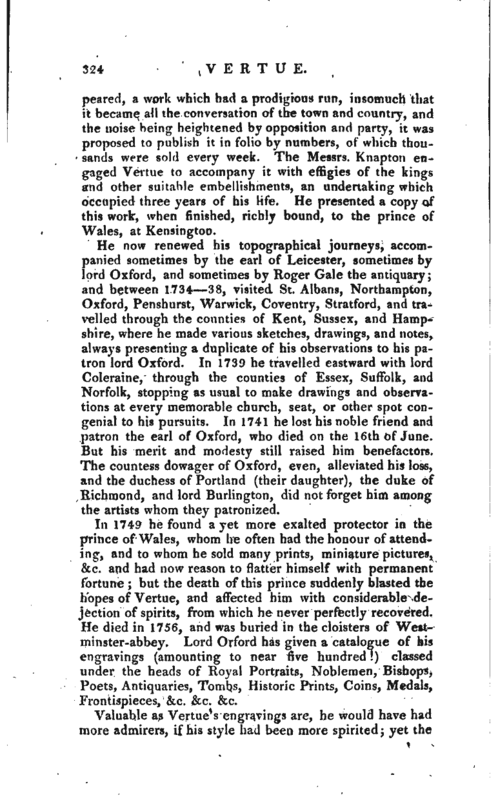 In 1749 he found a yet more exalted protector in the prince of Wales, whom he often had the honour of attending, and to whom he sold many prints, miniature pictures, &c. and had now reason to flatter himself with permanent fortune; but the death of this prince suddenly blasted the hopes of Vertue, and affected him with considerable dejection of spirits, from which he never perfectly recovered. He died in 1756, and was buried in the cloisters of Westminster-abbey. Lord Orford has given a catalogue of his engravings (amounting to near five hundred!) classed under the heads of Royal Portraits, Noblemen, Bishops, Poets, Antiquaries, Tombs, Historic Prints, Coins, Medals, Frontispieces, &c. &c. &c.
Walpole’s Anecdotes. Nichols’s Bowyer, where are many letters to and from Verlue, which present his character and industry in a very pleasing light.